Subtitle: Rulers have rules, but nobody pays attention. King Tomen rules in King’s Landing and theoretically all the Seven Kingdoms, but he is a puppet and there is a fight for who pulls his strings. At the moment his mother the Queen holds the reins on his reign, but her power is precarious (say that 5 times fast). 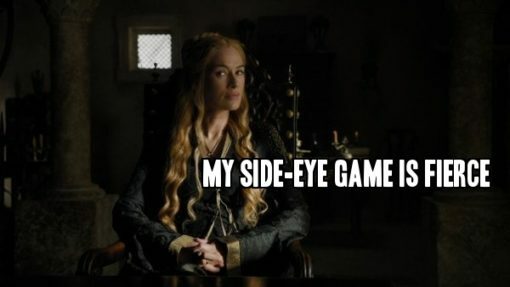 On one side is House Tyrell, and while Mace is able to be held off with flattery and the illusion of power (Cersei assigns him to two Small Council chairs in Tommen’s name), Margaery is a wild card and Cersei knows it. On the other side is what’s left of House Lannister. Tywin’s brother Kevan refuses to accept a council assignment and walks out of the meeting rather than listen to his niece. Meanwhile, Cersei’s brother Jaime is off on a Diplomatic Mission to Alderaan — okay, not really but I am now totally plotting my Cersei and Jaime Skywalker AU. The diplomatic mission is actually an extraction. Prince Doran — or someone using his name — sent Cersei a representation of a red viper (Oberyn) choking down a lion necklace (Myrcella). Thus Jaime heads to Dorne to rescue their daughter and forcibly recruits Ser Bronn on the way. Cersei’s other brother — not that she would claim him if she had the choice, in fact, she is encouraging people to kill any and all dwarfs in the hopes one of them will be Tyrion — is somewhat reluctantly on his way to helping Daenerys overthrow his nephew. 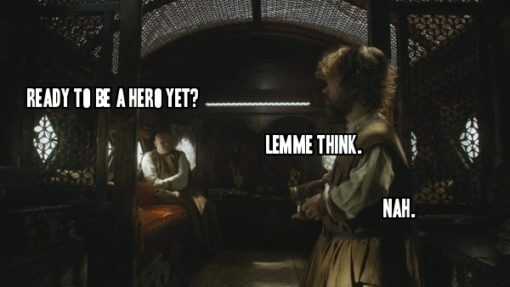 Varys continues to try and inspire him to do something other than drink and whine and Tyrion continues to ignore the advice and chafe at his security measures. Also on the road, Brienne and Podrick find Sansa and, unfortunately, Littlefinger. The way the scene was filmed, and especially after last week’s near miss, I thought they weren’t going notice her eating in the same tavern but Podrick not only saw Sansa, he saw through her hair dyed dark. Hurray! But Sansa, like Arya, has been burned one too many times by people offering her help, and she refuses Brienne’s service. It doesn’t help that Brienne failed to save two of the last three people she was sworn to protect (Renly and Catelyn) and can’t mention her sort of success with Jaime seeing as the Lannisters are the Starks’ mortal enemies. Anyhoo, Littlefinger tries to capture Brienne but she is way too baller for that and not only gets herself and Podrick free and clear, she catches a glimpse of where the Sansa-Petyr Road Trip of Doom is going and makes haste to follow. Podrick posits that if both Arya and Sansa turned down her offer of protection maybe she should be released from her vow but Brienne is clearly not one to give up easily (girl is so Gryffindor it hurts!). Arya is off on her own adventure in Braavos. She arrives at the House of Black and White, gathers her courage and asks for Jaqen H’ghar but she’s told there’s no such person here. Having nowhere else to go she tries to sit them out through the dark and the rain, and having nothing else to do she recites her kill list again and again. It’s the most disturbing pre-training montage ever. Finally she gives up, throws her coin into the sea and wanders into the city – where she is almost immediately saved from hoodlums by the man who turned her away at the door. Why close the door and ignore her just to turn around and protect her? Arya wants answers as much as I do and follows the guy back to the House of Black and White where he is revealed to be her old friend. But don’t call him Jaqen, he’s No One. 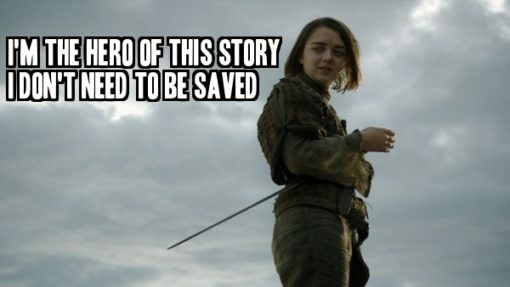 Arya decides that being No One is better than having No One on her side and follows him into her destiny. In Dorne, Prince Bashir Doran is visited by his late brother’s lover, Ellaria. We last saw her watching the Mountain squash Oberyn’s head so it’s understandable that she’s focused on revenge. But she is super focused on revenge. She wants to send Myrcella to Cersei in pieces and claims to have Oberyn’s attack daughters (the Sand Snakes) and the rest of Dorne on her side. Doran is disgusted and tells her so. He shoots her down while sitting on a veranda overlooking a garden and I am reminded of the first time I saw the film Watchmenand halfway through thought to myself “wow, Adrian Veidt is the only person I like or respect I bet he’s the ultimate supervillain” and I was totally right. I really like Prince Doran and I expect him to be evil or dead sooner rather than later. On the Wall, King Stannis continues to brainstorm creative but ultimately doomed ways to win the North. This week’s plan: turn Jon Snow into Jon Stark and use his name to rally poor dead Robb’s supporters. Just one problem – Jon Snow is such a Stark his honor won’t let him turn his back on the Night’s Watch. Poor Stannis, he should put his daughter in charge of negotiations. One, she’d be good at it and two, it’d get her away from his cray-cray Queen. Princess Shireen deserves better than this and I hope she eventually runs away to join Sansa or Arya or Dany or hey, Brienne. I would watch the heck out of that new best worst best! road trip. Anyway, Jon doesn’t even get the chance to formally turn down Stannis before he’s elected Lord Commander of the Night’s Watch. A good soul in charge elected by other good souls…I will expect him to be evil or dead soon, too. Finally in Mereen, Queen Dany has a mess on her hands. It turns out the formerly oppressed and their former oppressors don’t get along very well. Daario and Grey Worm catch a Harpy and her council fight over what to do with him but ultimately Ser Barristan’s plea to reign in the Targaryen penchant for, well, fire and blood and try on liberty and justice for all convinces her to go with a trial rather than a summary execution. Unfortunately not everybody got the message and one of the slaves-turned-soldier drags the Harpy out of his cell, murders him, and pins the body to the castle (pyramid) wall. Oops. Dany’s stuck with an even worse rock and a hard place decision but chooses to have the vigilante beheaded. The newly freed beg for mercy but she denies them and a riot breaks out between the former slaves and their former masters. Dany et al. get away unscathed, but she is clearly rattled. 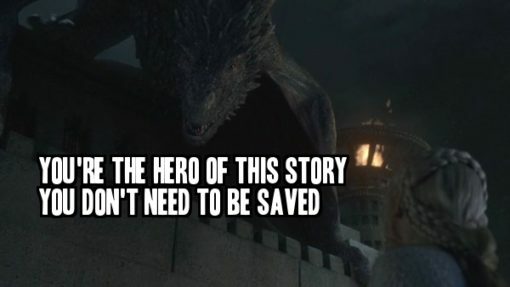 So rattled her missing dragon, Drogon, shows up to comfort her before flying away again. I like this because it means she has a psychic rapport with her dragon and that is amazing and I really want a dragon. Next week:The Boltons are back, things are brewing in the North. Dead: A former slaver turned vigilante and a former slave turned vigilante.